Allie McCrea, a member of Epiphany of Our Lord Parish in Plymouth Meeting and a senior at Mount St. Joseph Academy in Flourtown, knew nothing about the future Pope Francis and his thinking back in September 2012. She was looking around her church on Sunday mornings and not seeing many people her own age. Truthfully, those who were there didn’t appear to be especially joyful. 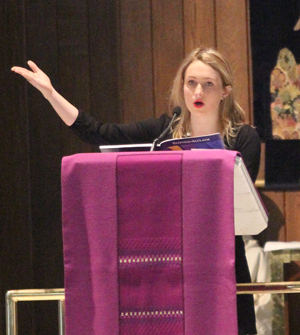 “Church has always been part of my life, my parents raised me in the faith and I have always gone to Mass,” she said. She knew many other young people are disconnected with the faith and she felt part of the problem was the music, which was alien to their culture. A choir member herself from early childhood, she talked to Connie Steuer, Epiphany’s music director, with the idea of forming a teen choir that would sing contemporary music teens could relate to. Steuer liked the idea but was fully aware that not everybody is suitable for a choir and the music is just one part of the liturgy. She suggested the proposed group take on other ministries at the Mass — altar servers, lectors, greeters and ushers. 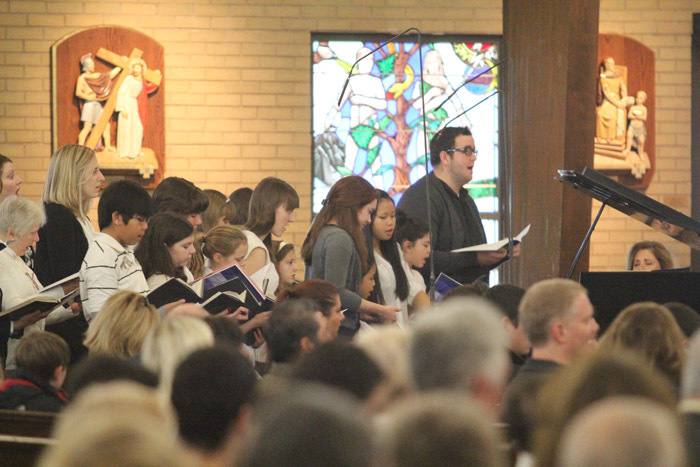 Father Joseph Quindlen, pastor of Epiphany, gave the project his enthusiastic support, and so “Joyful Noise” was born. Allie and two of her friends, Sean Monahan and Jaime Roop, spoke at all of the Masses on the weekend of Sept. 8-9 last year. The new ministry would be inaugurated at the 9:30 a.m. Mass on Sunday, Oct. 28, 2012, timed to coincide with World Youth Day and would continue throughout the year at approximately six-week intervals. The Masses would be followed by breakfast socials so the participants could further bond. The approximate six-week intervals between celebrations allow Joyful Noise to focus into the changes in nuance in the liturgy throughout the liturgical year. The real challenge was to find contemporary music that would appeal to young people and still be authentically liturgical. “We did research and came up with new music that works really well,” Steuer said. In fact many of the hymns sung can be found in the hymnals. What sets them apart is the arrangements, which are contemporary. To help this along Steuer assembled a professional ensemble of musicians to back up the singers and it has worked. Although the original intent was to focus on high school students, the group has been expanded to eighth grade through college years, which means if students like Allie stay in the general area for their college they can still be part of it in the future. Jaime Roop, one of the pioneers along with Allie, is a senior at Plymouth-Whitemarsh High School who also has always gone to Mass but he is thrilled, through Joyful Noise, that “I can bring my friends back to church,” he said. Matt Kozeniewski, a junior at Archbishop Carroll High School, is not one of the singers; he does his part as a greeter and usher. “Vibrant music is the key; young people want to come here,” he said. Also a lifelong churchgoer, he sees that between school and social life, church is not a priority with many of his peers. This is a great idea. The music in Church since the changes to the Roman Missle two years ago has been awful; in many parishes, the music sounds like a Requium which cannot be appealing to the youth. Either we keep the old requium type music and lose the youth or use the more modern music and attract the youth. As far as I am concerned, the key variable to monitor is the Gloria; it used to be very snappy and appealing but has been replaced with a version which is very, very unappealing.